In EV-infrastructure the market communication relies on unique IDs. Their definitions changed over time through the early development of the market mechanisms. 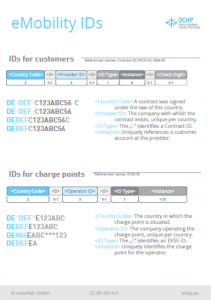 To help you maintaining the overview we’ve created a Poster on eMobility IDs. Here you find some common examples, illustrated definition and short descriptions of the fields. We hope you find it useful and are open to your feedback.